At a recent all-night prayer vigil, nearly 100 Roman Catholics gathered in a church ground floor chapel to pray the rosary in Cantonese for their fellow worshippers in mainland China. On their minds as they recited the prayer: a possible deal between the Holy See and China's communist leaders that is worrying many Catholics. Many Catholics in Hong Kong are confused and upset with the Vatican’s recent steps to resume relations with the Chinese government even as Beijing has continued to silence critics. In the nearly seven decades since its establishment, the People's Republic of China has not had formal diplomatic relations with the Holy See, a condition rooted in the Vatican's tradition of appointing its bishops worldwide — a practice the mainland Chinese leadership has historically viewed as interference in its internal affairs. 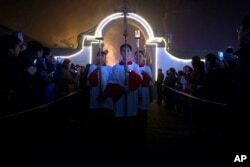 FILE - Cross-bearers process through the church grounds during a Christmas Eve mass at the Southern Cathedral, an officially-sanctioned Catholic church in Beijing, Dec. 24, 2015. China's Catholics have been allowed to practice their religion under a government-supervised entity known as the Patriotic Catholic Association in which the government officially names bishops. Some — but not all — of those bishops have been quietly approved by the Vatican as well. The Holy See has considered sacraments administered in the patriotic church valid, but the existence of the entity and the government's tight control of it has for decades has prompted many observant Catholics to practice their faith in a parallel, "underground" Catholic church, whose members see themselves as true followers of the church in Rome. The underground church is declared illegal and its members have been routinely subjected to arrest and ruthless persecution. FILE - Believers take part in a weekend mass at an underground Catholic church in Tianjin. Critics say an agreement between the Holy See and the Chinese government would allow the Vatican to operate more openly in China, but grant greater control to Beijing over the church's decisions. News reports have said the agreement would legitimize the government-appointed bishops and force those in the underground church to retire. The reports say the pope in Rome would have a final say over the approval of bishops, but Zen has voiced concern that Beijing would only name bishops loyal to the communist leadership. 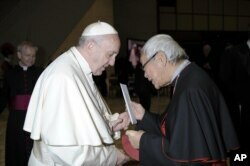 In this Jan. 10, 2018 photo made available the Vatican newspaper L'Osservatore Romano, retired archbishop of Hong Kong Cardinal Joseph Zen hands a letter to Pope Francis at the end of his weekly general audience. Several Catholics in Hong Kong have said the move can be seen as an appeasement, coming at a fraught moment when China has grown more authoritarian under President Xi Jinping. FILE - Chinese President Xi Jinping speaks during a joint press briefing at the Great Hall of the People in Beijing, China, Jan. 9, 2018. On Sunday, China’s ruling party announced it would end presidential term limits, an extraordinary move by a government that sought to avoid the dangerous one-man control exerted by former leader Mao Zedong. The move will, in effect, allow Xi to serve for life. 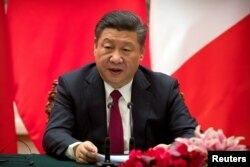 During his five years in office, Xi’s policies have attacked economic corruption as well as curtailed the work of human rights attorneys, labor organizers, investigative journalists and bloggers. In December, the Vatican asked two bishops in the underground church in China to relinquish their roles to men approved by the government. Vatican envoys asked Bishop Zhuang Jianjian of Shantou to step down and cede control to Huang Bingzhang, an excommunicated bishop and a member of China’s acquiescent legislature, the National People’s Congress, according to asianews.it. Guo Xijin, another underground bishop in Fujian province, was asked to serve as an assistant to Zhan Silu, another government appointed bishop. Previously, the Vatican had said that both men had been elevated illegally by the government. Opponents see it as an unusual intrusion, even violation, of the church’s authority. They are also concerned about signs that the government has restricted religious practice, such as orders that followers not bring children to worship. News of the Vatican’s negotiations prompted several professors to start a petition against any agreement that would cede control to Beijing. More than 2,000 people have signed.